Image source: John Tewell on Flickr. Colorized courtesy of Algorithmia. Although in late 1900, there was still an ongoing war between the United States and what it referred to as Filipino “insurgents,” to justify its benevolent occupation of the Philippines, the Philippine Commission1 authorized civil projects that were designed partly to improve the living standards of Filipinos and also partly to facilitate its occupation and governance of the country. One of these was the construction of the Calamba to Batangas road late in 1900. From an official report2 written by Lieutenant W. G. Caples of the United States Army’s Corps of Engineers, we get a colorful account of how the road was constructed. From the historian Manuel Sastron’s narrative on late 19th century Batangas3, regular readers of Batangas History ought to know that there was already a road for horse–drawn vehicles that led from Batangas to Manila; and this likely passed through Calamba as well. Caples’ report appeared to indicate that what the Spaniards had built were rough roads from Batangas to Calamba; and that the Americans intended to improve on these by building ditches to their sides and laying modern pavements over them. Caples had written: “The principal grading of the road had been done by the Spanish.” Although the lands the road would traverse between the towns of Batangas and Calamba were elevated, the road that the Americans were building would for the most part slope no more than 3 degrees. Implementation of the road building project began on the 1st of October 1900. The project called for a road that would begin near Laguna de Bay and pass through the towns of Calamba, Santo Tomas, Tanauan, Lipa4, San Jose and Batangas, to culminate near Batangas Bay. In total, the road would be 39.5 miles or 63.57 kilometers long. Funding for the project was estimated to amount to 150,000 Mexican dollars. Caples’ wording was ambiguous, but he seemed to mean that the funds were reallocated by the Philippine Commission from another planned road project from Calamba to the town of Nasugbu in western Batangas. Before the end of this first year of construction, “the laying out, clearing, grading and ditching a new line from the road from Calamba to Tanauan was done.” The following year, roads were completed from Laguna de Bay to Tanauan and from the Bay of Batangas to the town of Batangas. Ditching and grading was also started between Batangas and San Jose and between San Jose and Lipa. 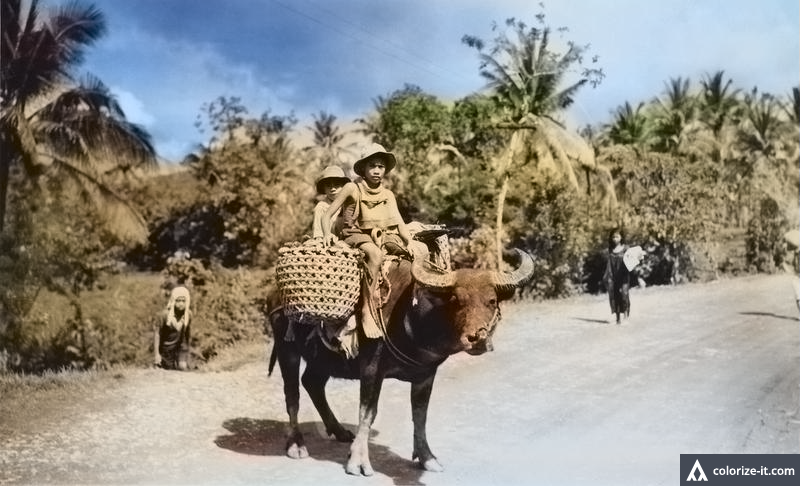 Later that year, the graded roads were layered with tufa, a type of limestone5 and road metal, “stone chippings mixed with tar to form the road surfacing material tarmac6.” By the 20th of March 1903, the project was fully accomplished with the completion of “metalled” roads from Batangas to San Jose, San Jose to Lipa and Tanauan to Lipa. 1 The Philippine Commission referred to in this article was the 2nd Philippine Commission, also known as the “Taft Commission,” which ruled in the Philippines on behalf of the President of the United States. “Philippine Commission,” Wikipedia. 2 “Report of Lieutenant W. G. Caples, Corps of Engineers, US Army, Upon the Construction of the Calamba-Batangas Road, Luzon, P.I.,” published 1903 in Washington D.C.
4 In 1900, the now–town of Malvar was still part of Lipa.